Below are the major activities month by month through 2016 in our garden in New Cairo, cultivated organically and according to biodynamic principles, as far as possible. I also mention the time-honoured agricultural calendar of Egypt, still in use today. This system originally divided the year according to natural events, e.g. the Nile flood that began in Aswan, Upper Egypt in June, reaching Cairo in early July (before the building of major dams from the 1840s onwards) and then steadily receding until October/November. The calendar may be upwards of 5,000 years old. Prune citrus fruit trees except for kumquat which is still carrying unripe fruit. Prune pear tree. Very light trimming of guava tree. Gather first crop of kumquats for marmalade (my first attempt ever to make marmalade: a success!) Add dressing of organic compost to fruit trees after clearing ground round them. Prepare ground for and plant 2 trees: fig and olive. Prepare 1 raised bed for planting. Plant onion sets (we are late – should have planted them in October/November). Transplant veg. seedlings e.g. celeriac.Prune and clear herbaceous border – stage 1. Sow seeds of annuals for borders in pots, cover at night. Pot on sweet pea, nasturtium, and marigold seedlings; plus aloe vera. Jan. 9th to Feb. 7th: month of Toba, first in the season of growth, named Peret. Rain/growth. Ancient link to Amun-Ra. Continue to prune and clear herbaceous border, cutting all roses and plumbago right down, lighter cutting for hibiscus and other shrubs. Spread compost on major herbaceous borders. Transplant sunflower seedlings to narrow bed backed by green fence dividing kitchen garden from fruit trees/flower garden. Trimming the rosemary: essential, but leave flowers for bees! Cut back rosemary and take cuttings (with a decent “heel”) to plant in pots and in empty corners of raised beds. Clear beds around fruit trees at back of kitchen garden and add compost. Trim hibiscus planted in beds outside perimeter fence/hedge, and feed with compost. Part-clear one raised bed of flat leaf parsley etc (failed to thrive), add compost. Sow seeds of salad leaves, beetroot, peas, dwarf French beans, carrots. Continue to harvest salad leaves, herbs, Swiss chard (use as for spinach) and other leaf crops. Feb. 8th to Mar. 9th: Amshir. Storms and wind. Link to ancient Meshir – genius of wind. Sow okra and courgettes around fruit trees (Engineer). Transplant tomatoes and celeriac into raised beds. Thin out mangetout seedlings and transplant some to raised bed 4. Sow a third crop of rocket, in raised bed 3. Transplant calendulas from containers to herbaceous borders. Buy in bedding plants (geraniums, petunias, pansies) and transplant to pots and window boxes. Also some traditional (taller) petunias and coleus for borders. Begin preparing new bed in front garden around palm tree by lifting grass and digging soil. Transplant rosemary from raised bed 3, and herb (oregano, borage) seedlings too. Plan is to fill with herbs and flowering plants specifically for the bees. Gather second kumquat crop; marmalade no. 2. Continue to gather salad leaves, parsley, rocket, and new chives for salads; also herbs for cooking. Mar. 10th to Apr. 8th: Baramhat. High temperatures, harsh sun. Montu – ancient god of war. Insert dried basil (not sweet basil) branches around mange tout as climbing frames. Sow new crop of sweet basil, by shaking seed heads gathered from last year’s plants in several spots around the raised beds. Gather last of salad leaves from the autumn sowing as they are becoming bitter and tending to bolt. Curly leaved parsley is now ready to harvest some leaves, but it is delicate. Harvest a few beetroot, partly in order to thin the row out (autumn sowing). Harvest chard for pasta sauces, to add to casseroles etc. Save seed from: rocket, sweet basil, spinach, dill, flat leafed parsley. First roses flowering: strong growth and excellent blooms following severe pruning and feeding over winter. Extensive work to upgrade the irrigation system: replacement of pipes, separation of systems watering a) the raised beds and b) the peripheral beds. Repair and re-positioning of sprinklers to work more efficiently especially re: watering the lawn. Spring Flower Show at El-Urman Gardens, downtown. Apr. 9th to May 8th: Baramouda. Last month in the season of Peret, or growth. Severe and drying winds, dust storms. Associated with Renno. Trimming of grass around beds and edges of lawn. Light pruning of straggling branches of plum tree. Third harvest of kumquats – about 0.5 kilo. Third batch of marmalade. First French beans, mange tout harvested. Plus some courgettes (not a success: avoid Seminis seeds in future). Herbs doing well, try drying some zaatar (Lebanese thyme). Save seeds: calendula, onion, mustard greens. May 9th to Jun. 7th: Bashans. First month in season of Shemu, or harvest. Associated with Khenti, a form of Horus. Excellent results from 2 cherry tomato vines planted in raised bed 4 after hugelkultur treatment. Approx. 10 – 12 kg harvested from all the vines (also in bed 3) over June/July. Also appearing: green peppers, turning red if left on plants. Basil productive this summer. Further sowings of rocket in bed 1. Not successful. Some onions harvested: 1.5 kg. Also peppers. Fruit: one pear taken. A second pear is nowhere near ripe. Jul. 8th to Aug. 6th: Epep, associated with Apep or Apophis, the great serpent killed by Horus. Guava crop almost totally failed: good quantity but ruined by infestation of fruit fly larvae. Will need to treat the trees next year before fruits form. First lemons picked – very good quality. Peppers thriving, tomatoes finished this month. Rest of onions harvested: total this year almost 3 kg. One sage bush, bought last year, has suddenly died almost completely – only one small section left – in bed 3, no known reason. Begin cutting hedge around the kitchen garden down to a more manageable height (about 7 feet). Enlarge middle section of herbaceous border, where there is no colour during the summer and plant vincas. Clean narrow border near house. Trim “mother” rosemary bush – again! Trim all hibiscus in beds outside the garden and feed them with (chemical) NPK feed – as this is outside the fence and not near the kitchen garden. Can’t produce enough compost to supply these beds. Remove dead wood from Indian laurel hedge outside garden and keep for re-use as hugelkultur in raised beds. Aug. 7th to Sep. 5th: Mesra associated with Mesori, birth of the Sun. SEPTEMBER This is the month of Tut (pronounced “toot”), the first month of the Coptic Christian calendar and of the agricultural year in Egypt. In the past, the Nile flood started to recede and the fellaheen, or agricultural labourers, prepared to plant the first crops of the year in the silt deposited by the river in flood. Our second pear: worth the wait! Fruit: second pear collected (we ate the first one back in July!) Very sweet and tasty. Lemons starting to turn yellow, in some cases orange (how bizarre!) in the sun. 1.4kg (3lbs) of kumquats gathered and turned into marmalade. Herbs plentiful, except for sage. Some regrowth of flat leaf parsley after cutting it back and collecting seeds. Work on raised bed 1: most of bed dug out, filled with dead wood, cuttings and leaves. Soil and sand replaced, and a generous top dressing of compost and horse manure applied. As it’s the month of Tut, I’m trying a limited sowing of seeds in RB4 mid-month: one row (extending along half the bed) of rocket and half a row each of flat leaf parsley and coriander. I think it may be too early, but will wait and see. Transplant rosemary cutting from RB1 to back of kitchen garden. Plan is to fill the whole of the bed along the hedge with a mix of basil, rosemary plus chives to help feed the bees. This will mean removing the remaining low-level, non-flowering shrubs in front of the Indian laurels. Transplant a bougainvillea found growing in RB4 to a corner at the back of the garden. Flower garden: huge problem of mealy bugs on roses in particular. Remove them by hand or by cutting roses right down. Remove seed pods from canna plants, dianthus etc. Climbing jasmine still flowering profusely – but not a good year for our Arabian jasmines. Sept. 6th to 10th: Nasie, 5 days between months of Mesra and of Tut. Sept. 11th to Oct. 10th: Tut, first month in the season of Akhet or the inundation. Associated with Thoth, god of wisdom. Complete hugelkultur treatment of RB1, adding top dressing of compost and manure. Sow green beans, peas, lettuce, Anaheim peppers, spinach, beetroot, winter purslane, dill and coriander in RBs 1, 3 and 4. Transplant one self-seeded celery into RB1. Cover temporarily with netting just above level of soil. September’s sowing of parsley, coriander and rocket in RB4 worked very well, and we are able to take rocket on a daily basis, the others more sparingly. Also note self-seeded watercress is plentiful in this bed, where it was originally sown a couple of years ago. Lemons now nearly ripe. 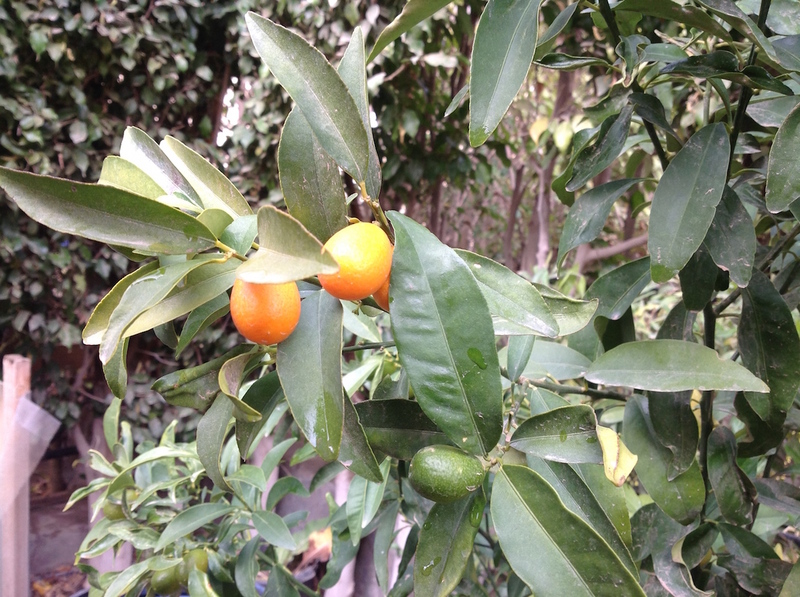 Another crop of kumquats developing well. Begin to cut height of hedge down for winter, taking another 45 cm off. Compost: contents of 3 bins emptied for use in RBs. One bin closed as now full and ready to leave to rot down. Second bin started. Oct. 11th to Nov. 10th: Paopi, associated with Hapi, god of the Nile inundation. Overhaul RB2 (hugelkultur). Rosemary, sage and basil plants relocated whenever possible. New small herb bed started near balcony towards front of the garden. Sow carrots, broad beans, mizuna, lettuce and chamomile in RB2. Make sure both RB1 and RB2 have full cover of netting supported by arches to raise them well above bed. Transplant 2 self-seeded celery plants into RB2. Also thin/transplant a few lettuce seedlings. Herbs sown in pots: lemon and Thai basils; verbena; sage; lavenders; lemon grass; lemon balm; chamomile. Also multi-coloured convolvulus. Positioned on sunny upstairs balcony and covered with clear plastic sheeting for a greenhouse effect. Continue work on hedge. Herbaceous border part-cleared, some perennials (canna/roses) cut right back; bottlebrush tree pruned. Hibiscus, basils in beds outside garden pruned, fed with horse manure. Fruit: lemons now very productive -> preparation of lemon marmalade; fruit preserved in brine; crystallised fruit; and frozen juice in cubes. Most seem to work well. Satsumas very good quality and quite plentiful. One guava discovered on the tree, weeks after the original crop!